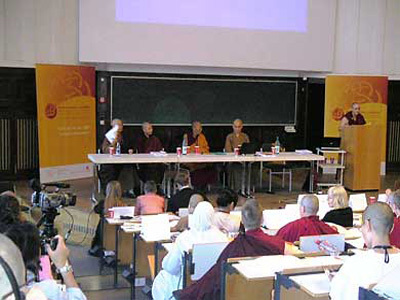 The First International Congress on Buddhist Women’s Role in the Sangha in Hamburg, Germany, July 18–20, 2007, was a great success. Organized under the auspices of the University of Hamburg and the Foundation for Buddhist Studies, it gathered together monastics from Tibet, Taiwan, Korea, Sri Lanka, Vietnam, Bangladesh, Thailand, and several Western countries, as well as academic scholars researching bhikshuni ordination and other topics concerning Buddhist nuns. With 65 speakers and nearly 400 participants from 19 countries, the conference consisted of two days of presentations followed by one day with talks by the first female Bishop of Hamburg and His Holiness the Dalai Lama in the morning and a panel discussion on bhikshuni ordination with His Holiness and other monastics in the afternoon. Bhikshuni Jampa Tsedroen and Dr. Thea Mohr were the principal organizers, and they did a great job drawing together this international group. The array of accomplished Buddhist nuns who attended the conference was inspiring. Abbesses of large Korean and Taiwanese monasteries spoke of the well-organized Vinaya training programs, Dharma studies, and meditation practices for the nuns at their temples. Monks from the Sri Lankan and Thai Theravadin traditions spoke in support of the introduction of full ordination for women (bhikshuni) in their tradition, and the Sri Lankan monks and nuns described how this was accomplished in recent years in accord with the Vinaya (monastic code of conduct). These monks, as well as those from the Chinese and Vietnamese Mahayana, and a Tibetan geshe endorsed and encouraged the introduction of full ordination for women in the Tibetan tradition. Western and Asian scholars told of their research in this area, the Tibetan nuns voiced their preferences, and many lively discussions evolved. His Holiness’ interest in and support of bhikshuni ordination and the geshema degree is unequivocal. Still, His Holiness’ interest in and support of bhikshuni ordination and the geshema degree is unequivocal. He stressed the necessity of having the bhikshuni sangha so that Tibet can be considered a Central Land, which is defined by the existence of the four-fold Buddhist community: male and female fully ordained monastics and male and female lay followers. “I wish more of an effort had been made to introduce the bhikshuni vow when Buddhism was first brought to Tibet centuries ago,” he said. Many members of the Tibetan bhikshu sangha are very conservative. Since there has never been a bhikshuni sangha in Tibet, they don’t understand why there is the need or interest to have one now. In addition, they want to see the ordination done in accord with the details of the Vinaya. Thus His Holiness encouraged the Tibetan sangha to do more research and have more discussion amongst themselves regarding bhikshuni ordination. Currently, there are two proposals for how it could be accomplished. The first is by ordination by the Tibetan bhikshu (monk) sangha alone. The other is ordination by a dual sangha of Tibetan bhikshus from the Mulasarvastivadin Vinaya tradition (followed in Tibet) and bhikshunis from the Dharmaguptaka Vinaya tradition (followed in China, Korea, Taiwan, and Vietnam). There are advantages and disadvantages to each method. The Tibetan nuns present at the conference preferred ordination by the Tibetan monks alone, saying that they felt most comfortable being able to take the ordination in Tibetan language, from their own monks in the Tibetan community, in the Mulasarvastivadin Vinaya followed by the Tibetans. Geshe Rinchen Ngodrup, from Seraje Monastery, described a way for this to happen according to the Mulasarvastivadin Vinaya. Other people think dual ordination by both the bhikshu and bhikshuni sanghas is more appropriate. Most everyone would be satisfied with whichever way the Tibetan bhikshu sangha thinks is appropriate. Very few monks in the Tibetan community are familiar with Geshe Rinchen Ngodrup’s and others’ research, so more education and discussion need to occur. His Holiness recommended that another conference occur in India, with many Tibetan geshes, abbots, and rinpoches present. He appreciated the attendance of the sangha from other Buddhist traditions and would like them to attend the future conference as well. His Holiness feels so strongly about having bhikshuni ordination in Tibetan Buddhism that he said he would cover the costs of this conference, which is planned for the winter of next year. His Holiness also encouraged the bhikshunis who practice in the Tibetan tradition and ordained in the Dharmaguptaka tradition to perform the three principal monastic rites together—the bimonthly confession and restoration of vows (posadha, sojong), the rains retreat (varshaka, yarne), and the rains retreat’s concluding ceremony (pravarana, gaye). He welcomed them to translate these rites into Tibetan and to conduct them in Dharamsala. I’d like to share a personal reflection. One day during His Holiness the Dalai Lama’s teachings on Aryadeva’s Four Hundred Stanzas that followed the conference, a sramanerika (novice nun) offered lunch to some of the Western bhikshunis. I found myself sitting at a table with a group of extraordinary women such as Bhikshunis Tenzin Palmo, Lekshe Tsomo, Jampa Tsedroen, Jotika, Khenmo Drolma, and Tenzin Kacho. Ven. Tenzin Palmo has been ordained for 43 years, two others for thirty years, and the rest over twenty years. Each one was learned, good-hearted, and actively involved in benefiting others by establishing monasteries, teaching the Dharma, running Dharma centers, and so on. This is indicative of how much the Buddhadharma in general and the Tibetan community in specific would benefit if Tibetan nuns were able to become bhikshunis and geshemas. At the conclusion of our lunch, we rejoiced in each other’s good works and pledged to pray for the success of each other’s projects and practices. I left feeling grateful and inspired by the joyous effort and abilities of these remarkable nuns and hopeful for the future of nuns and monks working together to spread the Buddha’s teachings for the benefit of all.